When Namine placed the memories in Sora, it pretty much made him see her as more then just a friend, Then when she told him the truth he seemed to like and care for her more. Do you think he cared for her more because he figured about how lonely and painful it might of been, and he saw the memories as being something she really wished she could of had? Also do you think Namine just because she was lonely and wanted a friend, or did she actually start to develop feelings for him yet was horribly turned down by Sora when he wanted his old memories back? the world that never was? Damnit, we need Smile here. Sora did like Nami more than just friends. Canon proves it. Sora has lots of friends important to him, and Namine is a lonely Nobody who is forced to mess with his memories. Sora does what other characters like him do, he tries to save the lonely character. I dont think it goes beyond anything more than Sora feeling bad and wanting to be friends with her. Any love interest between them most likely comes from the fact she's Kairi's Nobody. Roxas and Namine however are more than that. Doubt it. Namine wanted Roxas to fuse with Sora because she wanted Sora back. Not Roxas. She doesn't like Roxas like that if she's able to like. dont worry she always finds these threads. She cared so much about getting Sora back in KHII because she was helping out DiZ and she as well wanted revenge on Organization XIII. So, they both thought Sora was best for the job. This is why they wanted Roxas to fuse with Sora, to get his strength back. But they do talk a lot about being together forever at the end of the game because they can only be together always if Sora and Kairi are together, and Roxas and Namine don't want the trouble of having to work constantly to stay together, what with all the Heartless and such. Sora did have feelings for her because even after finding out that she changed his memories he said what he is feeling is not lie. But Nami is something different yes she liked him like a friend and that she fleet sorry for what she did to him but i think it was never had romantic feelings for him. But Nami was trying to replace Soras Feelings for Kiari. I thought that Namine just replaced Kairi with herself in Sora's memories, thus "switching" his feelings from her to Namine. As for Namine having feelings for Sora, I think that as Kairi's Nobody, it might only be natural, to have feelings as much as a "Nobody" can. Because he appreciated her honesty. It was a mixture. He saw someone he came to care for dearly, saw that despite it all, this person was the same person as the one he 'remembered' and therefore still deserved his feelings, and she was someone who needed him. Namine's the kind to put Sora before herself. Otherwise why help him? And why go to all this length to stay out of his life, knowing the risk her very existence was putting him in? Was she saddened when he chose the real Memories? Obviously. But like she told Riku when he refused to simply lock the Darkness up - she "hoped" he'd say that - I doubt she'd have been really happy had Sora chose to give up his real Memories for her. That's not 'her' Sora. 1) Namine and Kairi act differently, confirmed by Nomura. It wouldn't have worked out. 2) The Promise Memory. Kairi only arrived on the Islands on the night of the meteor shower, yet for Sora and Namine (And Repliku and Namine, lol) that was the strongest, most meaningful Memory. Whatever Sora felt for Kairi before CoM, whatever he felt for Namine was stronger as confirmed by Namine herself. Therefore, Kairi was always described by Sora himself to be a friend, but Namine to him, in his made up Memories, was more than a friend. 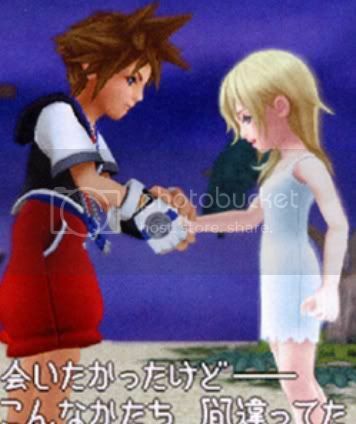 Despite Sora reaching out for Namine and holding on when he "found" her, and making the promise to her with a pinky swear, he kept his distance away from Kairi in KH2, and then broke the contact with her - as opposed to Namine being the one that pulled away in Re:CoM. Right before the Xemnas-armor fight, after their ride back was already destroyed and they were about to fight Xemnas because they had no other choice - sink or swim - it's hardly Kairi Sora thought about in what could've been his final moments - it was how he didn't get to thank Namine. someone can replace there feelings for someone even if they act differently. Except Namine was just placing herself in Kairi's place in the memories. If they way they both acted, therefore the actions themselves, were different, Kairi couldn't have been simply "replaced" in that case. not really the memories nami gave sora were before he meet kairi. Which makes what you said before even more redundant than it already was. 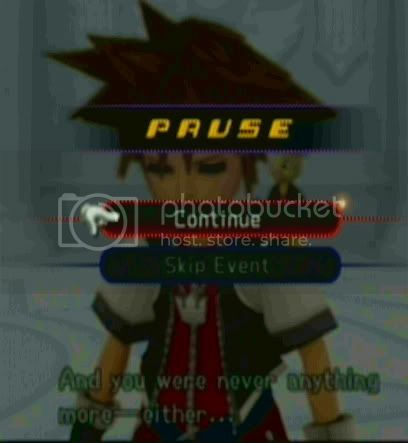 And the reason it's redundant is because Sora felt the way he did because of the Memories, not the other way around. And the Memories were unrelated to Kairi, making the feelings unrelated to Kairi as well. If he'd have felt like she was a kind, sweet, caring girl, like he saw her to be when he met the real her, the Memories of when she supposedly acted like Kairi wouldn't have "felt real" - but they did, showing the Namine he met was the Namine he remembered, making that not Kairi. I agree with this. But Roxas and Namine had little to no interaction, but still they seem to care for one another. But whatever, I guess caring is caring, regardless of how well the two of them know each other. Namine went from telling Roxas to get lost so Sora'd wake up, to agreeing to remember him so he'll remember her back and thus keep her from disappearing into Kairi :\ as much as I like to blame it on KH2's writing, nothing about her interaction with Roxas was selfless, let alone Roxas-oriented. It shows even better in Days when we see how much of a 'sacrifice' it seems to give up both Roxas and Xion. To Namine, the both of them are obstacles in the way to waking Sora up, and as much as she seems sad about not being able to save them, it's not like she really looked for some other way. If it meant getting Sora to wake up, the end justified the means - and not only to Riku and Diz. Maybe its just the writing, but Sora and Namine just felt more natural and emotional. While Sora and Kairi are kinda like shy middle school kids with crushes. Only real romantic moment I liked with SoKai was the cave drawing with the ompalumpa fruit. While Sora and Kairi are kinda like shy middle school kids with crushes. I think that with Sora's record of showing people he cares for that he cares, that it's not shyness that keeps him from showing it to Kairi. As for Kairi, shyness isn't really her thing. She's physically and emotionally clinging off of Sora. Only real romantic moment I liked with SoKai was the cave drawing with the ompalumpa fruit. Only even that is arguably not romantic, seeing Kairi's role as Home-representative and the fact Sora drew his share right before leaving out on a dangerous cruise.